As one of the famous tourist destinations in Indonesia, Yogyakarta realizes the importance of transportation to accommodate tourists who want to get around the city. For this reason, bicycle rental services using the application is one of the right solutions. 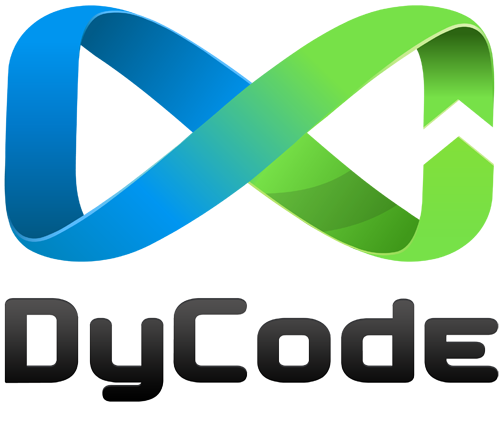 DyCode collaborates with JogjaBike and DycodeX to create a bike-sharing application that makes it easy to rent bicycles with a mobile application. This application is connected to the designated bikes, so users can monitor how long the bike is used and determine its route. 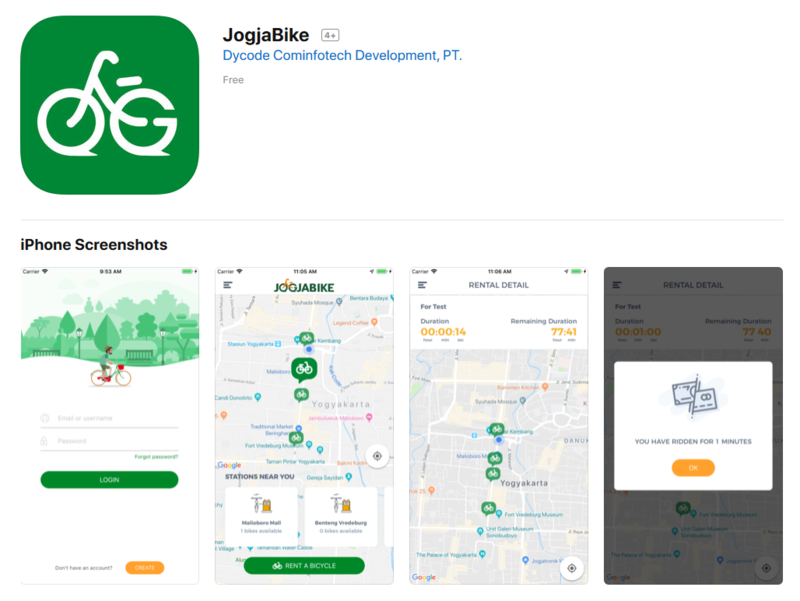 Some of the main features in this JogjaBike application include smart lock using QR Code, real-time route calculation, and emergency contact when there are obstacles in using JogjaBike. The app is quite simple. After downloading the application from Google Playstore or iOS Appstore, users are asked to register first. Users can see where JogjaBike is available which is spread over several stations. When riding a bicycle, users can find out the route from current position to the station along with its distance (in kilometers). When an emergency situation occurs such as a bicycle damage or an error during lock / unlock, the user can directly contact JogjaBike officers who will come soon to help. Users can also see travel history using bike-sharing, and how much it costs. As per December 2018, JogjaBike charges a tariff of IDR 10,000 for one hour of usage. 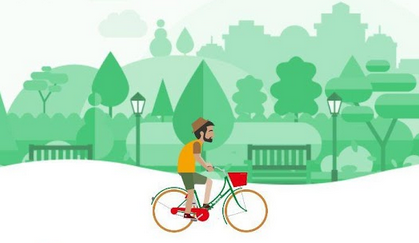 This bicycle and bike-sharing management system app is one step to realize smart city with a transportation mode that is integrated with mobile technology. The DyCode team designed this app by putting forward the full integration of the entire system so that the hardware and software are interconnected in a bike-sharing ecosystem. Planning a trip sometimes requires a lot of preparation. Looking for interesting places to visit while knowing the road conditions are very necessary to prevent any wasted time. 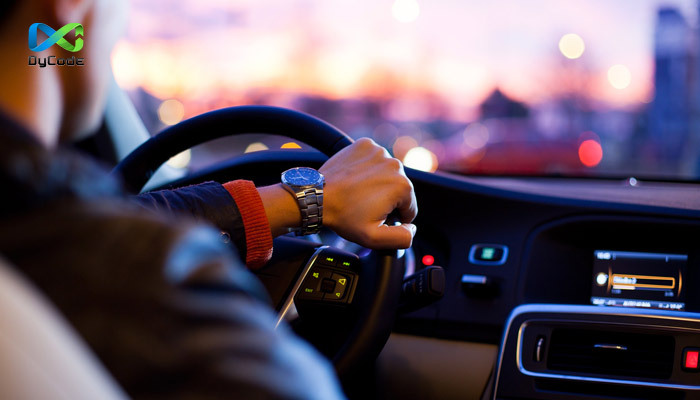 For this reason, a national automotive company needs an application that can provide information to make it easier for consumers to plan their trips. In addition, this application must also be able to provide solutions in times of emergency. DyCode built a mobile application that provides some information such as tourist attractions, reports on road conditions with the capability of serving real time data. Through this app, users can plan their trips more accurately. The user can search interesting places, and will get notification to reach the destination in an effective route. 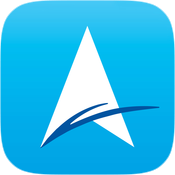 This mobile app also provides an emergency contact feature that can directly contact the nearest authorized service center when car trouble occurs. 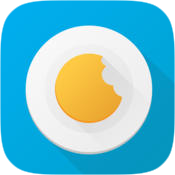 4 (plus 1) Apps by DyCode Untuk Upgrade Mudik 2016 Kamu, GRATIS! Lebaran sebentar lagi! Hari penuh perayaan ini identik di Indonesia dengan kegiatan mudik, sebuah perjalanan panjang menuju kampung halaman untuk bertemu keluarga dan sanak saudara. Namun seperti yang beberapa dari kita alamin, mudik itu nggak selamanya asyik, ya, nggak? Macet, belum lagi panas dan teriknya perjalanan bikin pengalaman mudik jadi stres. Tapi mudik nggak harus stres, kok! Kenapa? Karena deretan aplikasi recommended buatan DyCode di bawah ini bakal bikin pengalaman mudik kamu jauh lebih menyenangkan! Aplikasi apa aja, tuh? Yuk, simak deretan apps bawah ini, yang semuanya made by the creative hands of DyCode’s devs! Yang paling penting, semuanya GRATIS! Key feature: Dengan fitur car emergency reporting, kamu nggak usah takut mogok karena tinggal laporin via ANAVIGO, dan Astra akan siap perbaiki, dimanapun kamu! FoodGasm cocok buat kamu yang suka makan di kafe atau restoran karena bisa nunjukin mana yang paling deket dengan lokasi kamu sekarang. FoodGasm udah ada di kota-kota besar seperti Bandung, Jakarta, Bali, Jogjakarta, dan Solo, jadi kamu nggak perlu khawatir kalau laper dan butuh tempat makan yang cozy pas mudik! Key feature: Pesan tempat atau bahkan makanan yang kamu pengen langsung dari aplikasinya! Movreak adalah aplikasi buatan DyCode yang pas banget buat kamu yang lagi nyari film-film yang sedang tayang di kota kamu. Plus, kamu juga bisa baca review film yang pengen kamu nonton dari Movreak users, dan nulis review kamu sendiri! Key feature: Movreak bisa tunjukin jadwal film yang tayang di bioskop terdekat kamu! Jepret Story cocok banget buat kamu yang nggak mau kehilangan momen lebaran. Selain bisa mengedit foto dengan banyak pilihan filter, kamu juga bisa bikin customizable postcard yang bisa dibagikan ke orang-orang terdekat kamu. Key feature: Bikin album foto lebaran dari sosmed kamu nggak pernah semudah ini! Caranya tinggal set up hashtag, semua foto di sosial media kamu secara otomatis terkumpul. 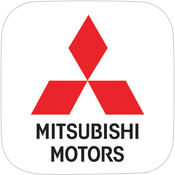 KTB Mitsubishi Motors adalah sebuah aplikasi dari distributor resmi Mitsubishi Krama Yudha Berlian Motors yang bagaikan memiliki seorang dealer mobil di dalam saku! Key feature: Kamu kudu sering-sering cek Special offers di app ini karena Mitsubishi suka bagi-bagi voucher dan ngebocorin informasi diskon untuk spare part mobil Mitsubishi favorit kamu! Movreak currently expanding its coverage area. Having previously routinely provide support data for the area of ​​Singapore, Movreak will now move to the wider region. Movreak is currently being tested to be able to support the data of ​​Malaysia. For now, only the area of ​​Kuala lumpur and Penang are available. If the trial is successful, the other cities will soon be available. DyCode bekerja sama dengan XL mengadakan acara launching resmi salah satu produknya, Movreak, pada 30 Maret 2013. Acara ini dimeriahkan juga dengan nonton bareng film G.I Joe: Retaliation serta bagi-bagi hadiah berupa gadget, boneka, majalah serta merchandise-merchandise menarik lainnya. Acara yang diadakan di BlitzMegaplex Bandung, Paris Van Java, Auditorium 7 ini menarik banyak perhatian khalayak. Terutama karena tiket gratis untuk acara ini dibagi-bagikan melalui media twitter bersamaan dengan kuis-kuis berhadiah yang sangat menarik. Dalam acara ini, Movreak secara resmi merilis Movreak untuk Android. Sebelumnya, Movreak for Android masih dinamakan “Movreak Preview”, dan pada acara launching kemarin, secara resmi Movreak mengeluarkan versi untuk platform android dengan nama V1. Untuk melihat bagaimana meriahnya acara Movreak Launching ini, simak saja foto-foto di bawah ini. Movreak Launching! Already on All Platform! One More Surprise! Yes, update for Movreak iOS! After a long wait, finally Movreak for Android launched in 12-12-12 promptly at 12:12. Movreak for Android was even launched, but already has the look of the latest Movreak UI update which will be released for other platforms. First used on Movreak for Android. Movreak is the application for the movie lovers. 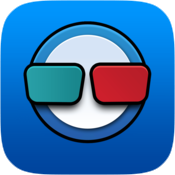 With this application, Movreak’s users (Vreaks) can see what movies are currently running in theaters. Not only that, the Vreaks can also see the synopsis, schedules, theater locations, and even read or write reviews for films of interest. Users can also connect to social networks like twitter, facebook, etc..
Movreak apps, now available for Windows 8 OS. Movreak app is currently available for iOS devices (iPhone, iPod Touch, iPad), Nokia Symbian^3 devices, Nokia S-60 (for Asha Full Touch), BlackBerry, Windows Phone, and now for Windows 8. Movreak for Windows 8 has all the Movreak (previously, for other platforms) features and some upgrading on the display and layout. We work really hard to make Movreak app has simple UIs, intuitive, easy to use, yet still pay attention to aesthetics. Mindtalk.com is a raising social networking service in Indonesia. "Kereta Api" is Indonesian Language for “train.” As a public transportation in Indonesia, the train network is available in Java Island and Sumatera Island. 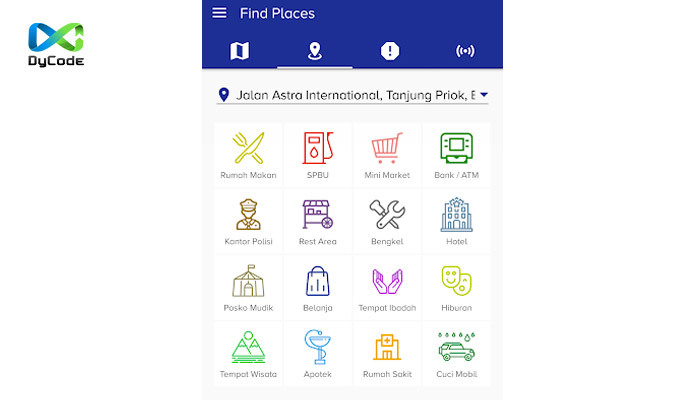 Tiket Kereta is an application that allows you to buy train tickets via your mobile phone. Payment methods accepted are bank transfer to Mandiri and BCA and payment through klikBCA. This application is free and intended for people living in Indonesia. 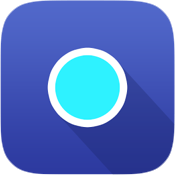 There are two versions of this app, the Asha version for the portrait, non touchscreen device and the Asha Full Touch version for the touchsreen devices. GeekFestID app is the app for GeekFest Indonesia event, that will be held on March 31 – April 1, 2012 in Bandung. It’s the first event in Indonesia that is all about the celebration of the geeks. Venue: for non-Bandung participants, you can check where’s the venue on map, get route to it, and check-in to Foursquare. About: what’s the event all about and the organizers. For more detail about the event, follow @GeekFestID and stay tune to #GeekFestID hashtag. Or just use Tweet feature in the app. GeekFest app for WP7 and Symbian version are waiting for review. However, you can download unsigned (not yet certified, but completely safe) version of GeekFest for Symbian. Update on Apr 1, 2012: GeekFestID app for Windows Phone is approved on the last day of the event. Download it here. Fix a bug on venue which map shows wrong location. Sorry for that guys. Tweets by hashtag now can show more than 50 tweets. Just pull up (at the bottom of the table) to load more tweets. Images in post can be saved to photo library, or opened on Safari. Add three more menus: Mini Stage, Competition, and Maskot.